Born in 1938 Per Kirkeby is one of Denmark’s most well-known living artists. His paintings are characterised by an expressive use of colours and forms and by recurring motifs such as tree stumps, beams, rocks and effects of layering. These refer to his deep-seated interest in natural history and geology, which he studied before becoming an artist. Kirkeby has realised many public commissions, including sculptures, stained-glass windows and paintings for a few churches. One of them is Gentofte Church in Gentofte, a suburb of Copenhagen. Inside, Gentofte Church offers a simple, rather intimate space. It is almost entirely rectangular and narrow, with the exception of a small side-extension to the north, where the organ is placed. The eleven windows have been given titles that point to biblical themes from both Old and New Testaments. First are The Tables of the Law (south wall, close to the altar), then the Entry to Jerusalem, the Last Supper, Christ Agony at Gethsemane, Golgotha, the Crucifixion (west wall, facing the altar), the Flight into Egypt (north wall), the Sermon on the Mount, Paradise (i.e. the Garden of Eden), Sodom and Gomorrah, and, finally, the Deluge (north wall, close to the altar and facing the window representing the Tables of the Law). 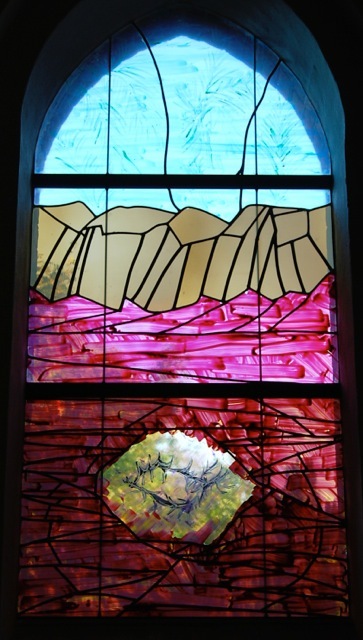 To make these stained-glass windows Kirkeby collaborated with Per Hebgaard, a renowned stained-glass artist. The new windows were inaugurated on 14 September 2008, after four years of work. 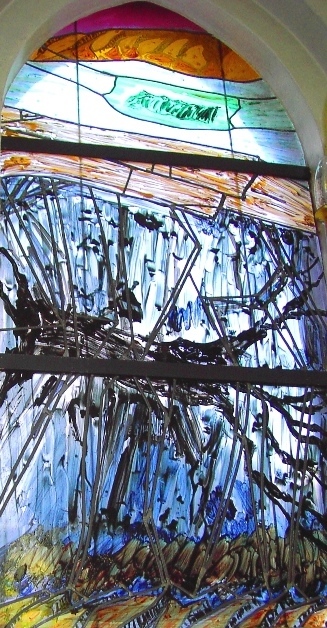 Even though each window is connected with a biblical episode, they tend toward the abstract. Upon closer observation a few distinctive elements are identified, which refer to the story depicted, almost like a “clue”. For instance on the window representing the Entry into Jerusalem, there are a few palms and a crown of thorns drawn onto the painted glass. Kirkeby’s visual strategy is not unlike the synecdoche in the linguistic field: a part of the usual representation stands for the whole. 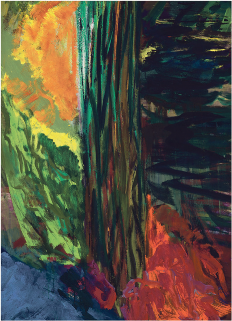 Kirkeby has said that, in his eyes, a modern painting about the Crucifixion cannot be an illustration of the biblical narrative or a repeat of conventional iconography. The Danish artist aims to move away from anecdotal depictions in order to create artistic expressions of Christian themes reflecting his own faith. The colour, form, and texture of these stained-glass windows are expressive and as such invite meditation. 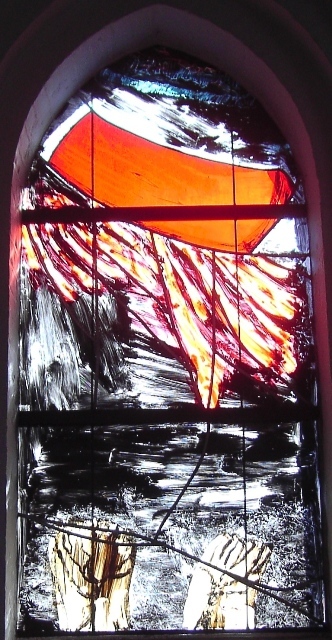 For example, the stained-glass window that was inspired by the Crucifixion is dominated by a dramatic contrast of colours: red and black. The bright red evokes blood, murder and thus the Passion of Christ. The lines in which the red is contained are powerful diagonals going downward, almost projecting towards us, giving us a feeling of violence. As a colour black suggests the darkness of death and mourning, and reminds us of the obscurity that followed the death of Christ on the cross. The black is almost frantically applied in harsh, irregular lines going in multiple directions. They convey a sense of chaos and turmoil, a feeling of being upset. Up close the texture reveals that the colour is neither smoothly nor equally applied. Kirkeby’s expressive handling of paint evokes emotional distress, anger and sorrow. Thus the formal qualities of this window reflect one aspect of the Crucifixion: the violent death of Christ on the cross. Kirkeby achieves an effective correspondence between visual effects and symbolic meaning. In 2012, he added an element to this liturgical space with an altarpiece. The painting represents a trunk or a wooden round post planted in the ground. It forms a strong vertical axis from the bottom to the top of the canvas. In the ecclesiastical context it evokes the wood of the cross. But the tree can also be a symbol of the human being and, in other contexts, it serves as a representation of the axis mundi. Kirkeby embraces the openness of his works. They encourage the viewer to rely on his or her personal response to the work in order to interpret it and to meditate on the theme that prompted the work. Contrasting the somber colours at the right side of the painting the colours are lighter on the left: green, yellow and orange. They convey a different set of feelings that may evoke the promise of the Resurrection. Per Kirkeby (b. 1938) is one of Scandinavia’s most celebrated living artists. Originally he was trained as a geologist. Influenced by his scientific roots as well as the gestural works of the Abstract Expressionists, Kirkeby creates expressive, heavily layered paintings, which can resemble geological strata, the Danish landscape and even the female form. “The role of art is to accept that things break down,” he says, “That’s the only way to get something new to emerge.” Known for being uncategorizable, Kirkeby works across media, including architecture, poetry, film and sculpture. Caroline Levisse is an art historian currently based in London, where she teaches art history. In her doctoral dissertation she studied the different ways in which art and religion interact today in Scandinavia (Art et religion en Scandinavie depuis 1990, Université Paris 8, 2013). About the windows (in Danish), see: Mikael Wivel, Glas og bly. 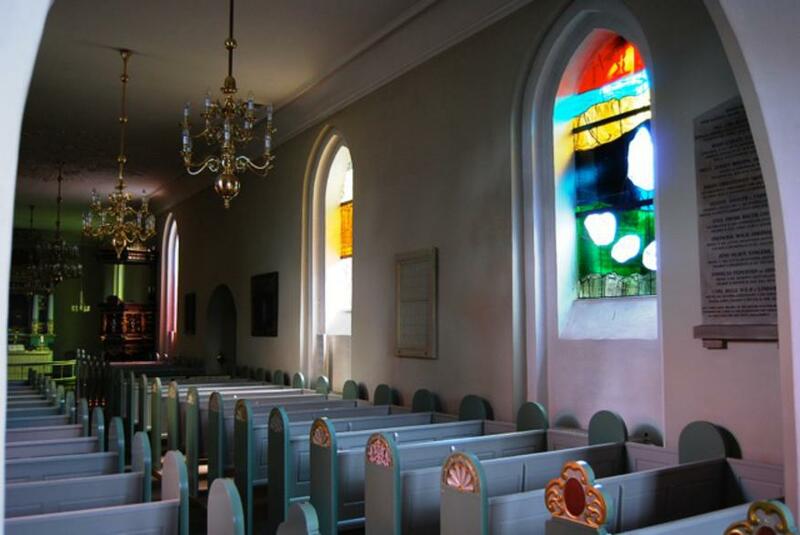 Per Kirkebys glasmalerier i Gentofte kirke, Kristeligt Dagblads forlag, 2010.